With the meetings tool, you can create and share meetings links so your prospects can book time with you based on your availability. Group Availability: Group Availability meetings allow you to include multiple members of your team and show the overlapping availability of all parties involved. Round Robin Availability: Round Robin Availability meetings facilitate scheduling when there isn’t a designated sales rep and show combined availability across a team. Prospects can schedule a meeting with the sales rep whose availability works best for their schedule. In the upper-right corner, click Create meeting link, then select Team. Click the meeting type you would like to create: Group Availability or Round Robin Availability. In the Team members section that appears, click the dropdown menu and select a team member to add to your meeting. If you're creating a Round Robin meetings link, select the If contact is owned, show owner's calendar checkbox. Learn more about what this means in the next section of this article below. Please note: your team member must be a HubSpot Sales Hub Starter, Professional, or Enterprise or Service Hub Stater, Professional, or Enterprise user and have a connected calendar before they can be added to a Group or Round Robin Availability meeting. Finish creating your meetings link. In the dialog box, copy the link to start sharing it with your contacts. Please note: once the meeting link is created, the user that created a Group meeting link cannot be removed as a member of the link. However, a user that created a Round Robin meeting link can remove themselves from being a member of the link. 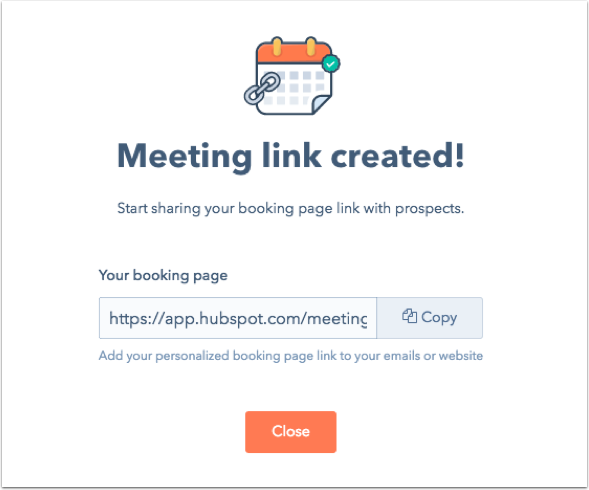 Group Availability: HubSpot will automatically check the custom availability you set in the Availability creation step against the selected team members' integrated calendars and block off busy times. If a user has multiple integrated calendars, HubSpot will check this custom availability against all the calendars. When adding team members to a Group Availability meetings link, your prospects will be able to select any time that one of the selected team members is available. When a prospect clicks the meeting link, they will see time slots that work for you and the other team members you've selected. They can select a time, then add their details to book the meeting. The creator of the meeting will receive a notification and the meeting will appear on the calendars of all meeting participants. Round Robin Availability: HubSpot will automatically check the custom availability you set in the Availability creation step against the selected team members' integrated calendars and block off busy times when none of the selected team members are available. If a user has multiple integrated calendars, HubSpot will check this custom availability against all the calendars. 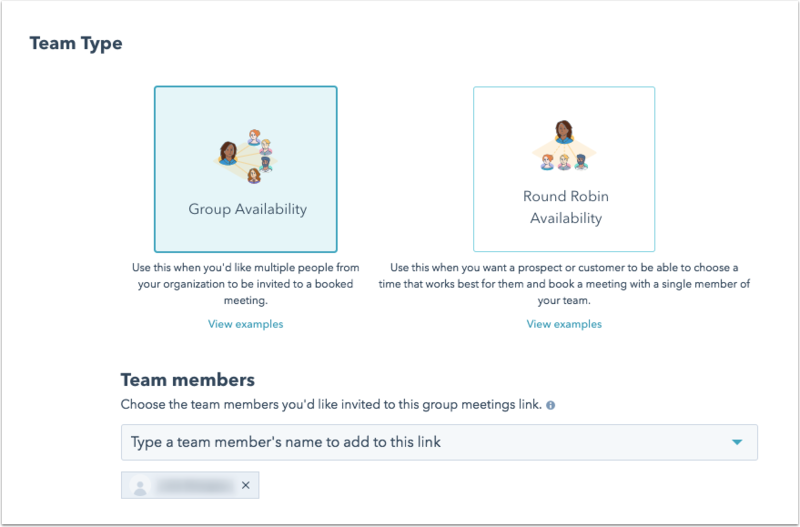 When adding team members to a Round Robin Availability meetings link, your prospects will be able to select any time that one of the selected team members is available. When creating the meetings link, you can also select If contact is owned, show owner's calendar. With this option selected, prospects arriving to your meeting link will be asked to enter their email address first. If they are an existing contact in your database with a contact owner, then their owner's booking page will be displayed. If the contact is owned and the owner is a paid Sales Hub or Service Hub user with meetings set up, is part of this Round Robin link, and has availability, the tool will present times where the contact owner is available using the availability specified in the Round Robin link, not in the owner's default personal meetings link. 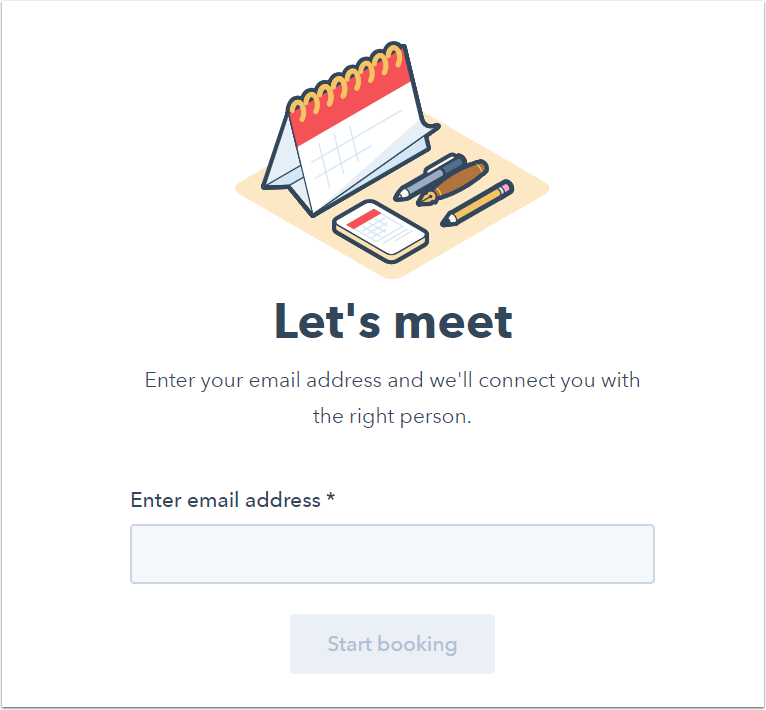 If the contact is owned and the owner is a paid Sales Hub or Service Hub user with meetings set up, is part of this Round Robin link, and doesn't have availability, then the contact will not see any availability and will instead be presented with the option to email their owner. If the contact is owned but the owner is not a paid Sales Hub or Service Hub user with meetings set up or is not part of this Round Robin link, then the Round Robin link will operate as usual, presenting the availability of all users. If multiple users on the meetings link have availability during the time a contact books a meeting and the If contact is owned, show owner's calendar option is selected, then a user will be selected for the meeting at random. When a prospect clicks the meetings link, they will see time slots that work for any selected team members. They can select the time that works best for them, then add their details to book the meeting. The HubSpot user who is available during the selected time will be booked for the meeting and receive a notification. The meeting will appear on their calendar.